If you’ve been on social media recently, you might have noticed some of your favorite artists “going blue.” The #TIDALforall hashtag has also been making its way around Facebook and Twitter in preparation for the launch of this new music streaming service. On March 30, Jay Z, along with 16 other artists (who happen to be part owners) came together to introduce TIDAL, which supposedly will be the newest revolution to the music industry. In March 2015, Jay-Z bought Aspiro, a Swedish music streaming company and the parent company of TIDAL. At first glance, TIDAL draws many similarities to Spotify, but what stands out is its pricing. Subscribers with a “HiFi” subscription will pay $20 per month to listen to all content in lossless quality. Premium users would pay $10 a month and have access to all music offered, but are restricted to mere “high quality” sound. TIDAL also offers exclusive content such as music videos, interviews, and Taylor Swift’s albums. According to their website, TIDAL offers “high fidelity sound quality” which, they argue, is what sets them apart from other sources of music like Spotify, Pandora, and Youtube. High fidelity quality, or HiFi, seeks to enhance to music listening experience. But is there really a difference between the qualities that TIDAL celebrates and regular quality? TIDAL’s website offers a more broken down explanation. Normal quality music has 96 kilobits per second (kbps). Their high quality music has 320 kbps. Spotify offers a 320 kpbs stream as well, but TIDAL’s HiFi quality music has 1411 kbps, which is also known as lossless. Their website doesn’t offer any explanation of how this helps the listener. But basically, the higher the kpbs, the better the sound quality supposedly is. To further prove their point, TIDAL offers a blind test to anybody who’s curious or skeptic about HiFi. Depending on the score, TIDAL will “reward” you with anywhere between a seven to 14 day trial. Ironically, their website offers a free 30 day trial. Can you tell the difference? In order to properly get the HiFi experience, TIDAL says to have good quality headphones and to not use laptop speakers. As a broke college student, all that was available to me were my Apple earbuds. On my first try, I scored zero out of five correct; on my second, I got 1. TIDAL is aware that not everyone will be able to detect the difference (as proved with their disclaimer), and if you don’t have access to high quality speakers, TIDAL may not be for you. But, if you’re an audiophile, you may want to try out the 30 day trial to see if it’s worth the investment. However, if you’re a person with simple needs, I would recommend sticking to Spotify. 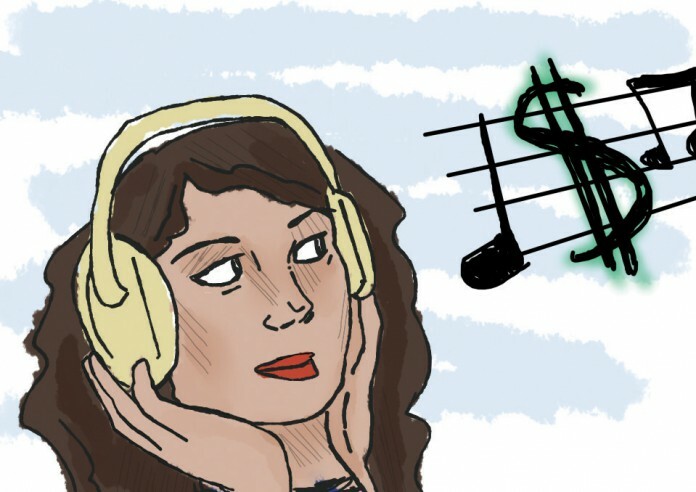 Spotify’s premium and TIDAL’s premium subscriptions offer the same things for the price of $10. Both have a stream of 320 kbps and are ad free. The deciding factor between these is that Spotify offers a student discount of 50 percent off (making it only $5 a month). If Taylor Swift and exclusive content really mean that much to you, then pay the extra $5 and go for TIDAL. Will it really revolutionize the music industry? Will it flop? Is this a part of the Illuminati? I don’t really know. So far, TIDAL doesn’t seem to have made a big impact on the music industry. It seems to be targeted at fans who want to connect to their favorite artists and those who really love music. All I do know is that I clearly cannot tell the difference between HiFi and regular high quality music.